This happens when a cyclist is traveling on the right side of the road - the correct side - along a street that has cars parked on the right side of the road. Meanwhile, a driver in one of the parked cars does not look in the side view mirror and opens the door. 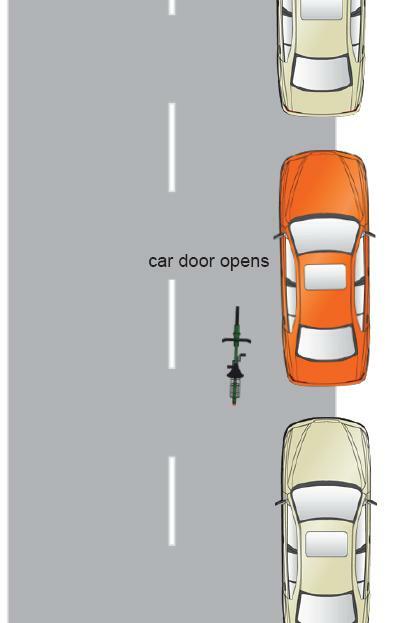 If the opened door is too close to the cyclist, the cyclist does not have time to react and he hits the door. Slow down. When you are on a street with cars parked on the right, slow down so you can stop in time to avoid hitting a suddenly-opened door. Right close to the center. When you are riding on a street with cars parked on the right side, try to ride more to the center of the lane so that if a car door opens it will not hit you or cause you to crash. Most likely, the fault will lie with the person exiting their car. The driver is probably negligent, which is simply the failure to use ordinary care, for not looking to make sure it is safe to open the door. But again, you must remember Virginia is a contributory negligence state. This means that if you as the cyclist are negligent in some way (e.g. going too fast, not riding at night with a light) then you cannot recover for you injuries. A jury or a judge makes the ultimate determinationof whether the car was negligent and whether the cyclist was contributorily negligent.